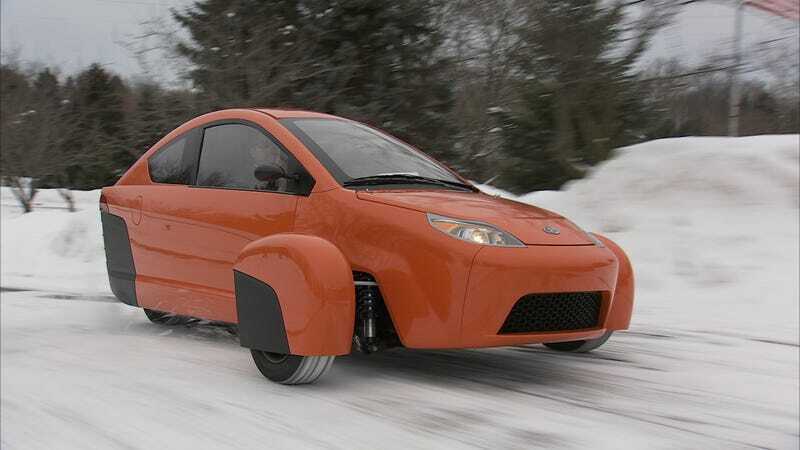 Elio has released their "definitive" 2016 model at the Consumer Electronics Show in Las Vegas, even though the electric-looking three-wheeler is gasoline powered. Our very own Tavarish spoke to Elio's CEO a few days ago and The Verge's Sam Scheffer took the fourth version of the vehicle out onto the strip for some fantastic video. I have to admit, I really liked the camera work on The Verge's report, and I am pretty envious of Scheffer's time driving the vehicle. The version driven by Scheffer is apparently the "definitive" 2016 version which will be available at the end of 2015, according to Canada's CTV, with Elio standing firm at 84MPG and the $6800 price tag (although Elio's CEO told Tavarish that the car could be released today—if we were willing to accept a lower MPG and a higher price tag). Let's be honest, we've been pretty skeptical of Elio's plans for the last couple of years. Tavarish and I have discussed Elio at great length, as both of us pursued speaking to the CEO (with Tavarish actually doing it). While I think the general consensus of the Jalopnik crew has been that we have our issues with its plausibility, I for one am rooting for it. I'm not even cautiously optimistic. I'm just plain optimistic. This Startup Will Buy An Old GM Plant In Louisiana, But Is Their Car Real Or Vaporware? Okay, no, optimistic isn't the right word. Giddy. I want one. I want one now. And I want it here in Japan. Even though all I've managed to get on that topic from Elio's people is a "sure, we're looking into international markets, but right now we're focused on North America" (note, necessary disclaimer, that's not a direct quote, or even a rephrasing of something close to it, but that's about the long and short of my reading of what I've been told). Tavarish has even gone as far as to argue with me about how applicable the Elio would be on Japanese roads. He seems to think it wouldn't be nearly as good of a fit as I do. I don't care. I want an Elio anyway. And at $7000, it would be something I could afford easily. Today. So, Elio, when do I get to drive this sucker around Tokyo? If you guys even bring a single car show model here, I want to be first in line to drive it. Cool? Cool. Image via Elio/Video via The Verge.